Last November, the Geological Society of London issued a "Statement on Climate Change." It's a relatively clear and straightforward statement that summarizes the current state of our climate and relates it to significant climatological changes in the past. The Geological Society of London was founded in 1807. It is the UK national society for geoscience, and the oldest geological society in the world. As a highly regarded professional, scientific organization, one should take statements like these very seriously. When individual scientists make statements, it is possible they are tainted by personal bias. When the Geological Society of London makes a statement, it represents thousands of scientists, and carries much greater weight than any one particular scientific paper or one individual scientist's perspective. There are 10,000 members of the Geological Society. The Geological Society's statement is mirrored by statements made by virtually every other reputable scientific organization on the planet. There are no reputable scientific organizations that dispute the scientific consensus that: 1) the planet is warming; 2) humans are partially to mostly responsible; and 3) the outcomes are likely to be significant and negative for human civilization. I chair a monthly gathering of professionals called the Green Business Roundtable. In partnership with the Wharton Club of DC, the GBR usually meets at the National Press Club for a buffet lunch and a guest discussion leader. Click on the Facebook link to the right for updates and notifications of upcoming meetings. Recommecting America is a web site dedicated to promoting, advocating for and improving Transit-Oriented Development. Reconnecting America is a national non-profit organization that is working to integrate transportation systems and the communities they serve, with the goal of generating lasting public and private returns, improving economic and environmental efficiency, and giving consumers more housing and mobility choices. Their sister site, the Center for Transit Oriented Development is focused more on that specific topic, but the two are interrelated. I recommend joining to receive their daily updates, which link through to a tremendous number of articles related to this topic. I learn something new almost every day. 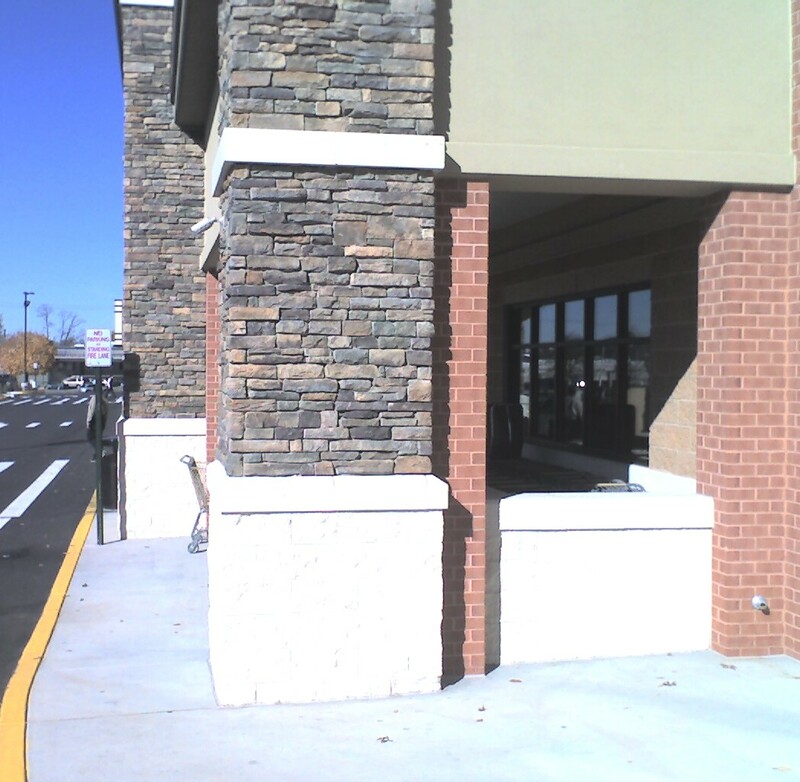 The Safeway in the Willston Center near Seven Corners in Fairfax County recently underwent a major renovation. 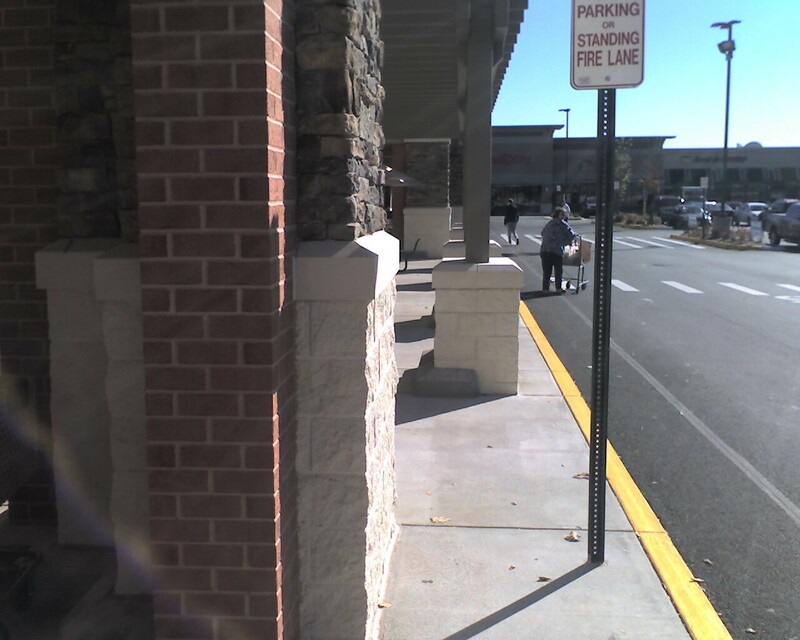 This renovation provides no access for pedestrians along the sidewalk in front of the store, forcing pedestrians to walk in the parking lot. 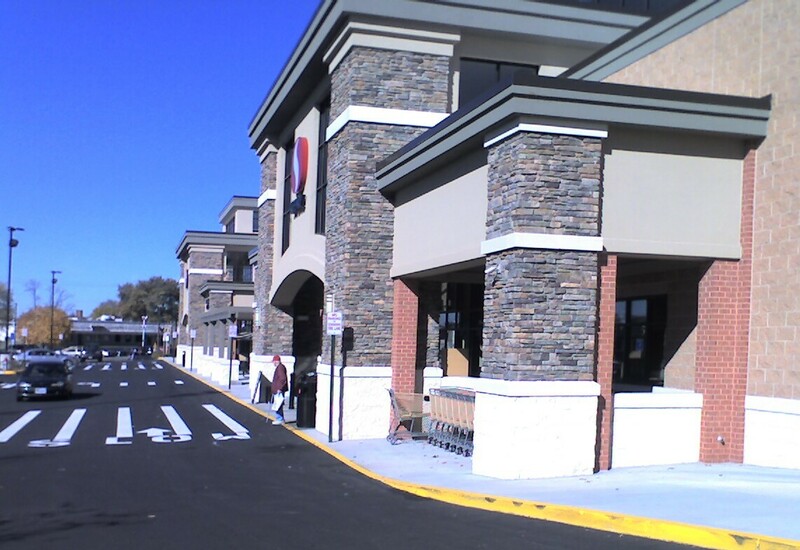 The new renovation is a vast improvement over the old Safeway store that was here. It's bigger, newer, cleaner and includes a Starbucks Coffee. 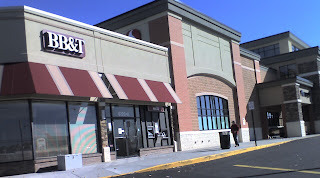 Unfortunately, no one paid any attention to how the front of the store interacts with the parking lot and the sidewalk. This Safeway is not a stand-alone store. It is in a strip that contains a dozen other establishments. It is also adjacent to and very near a large number of apartment buildings, and a significant number of users (myself included) can and do walk to this strip. So it is not a suburban, car-only type of place, even though it has a large parking lot in front. 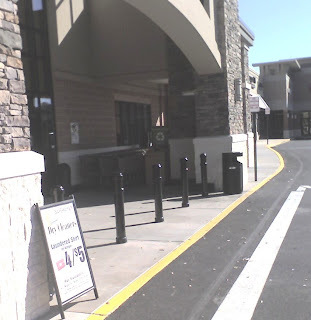 Although many users come to the Safeway, many also come to the other establishments, and if they wish to visit any that require them to pass by the Safeway (which is in the middle), they must walk into the parking lot to pass in front of the store. Here are some photos to help explicate the situation. 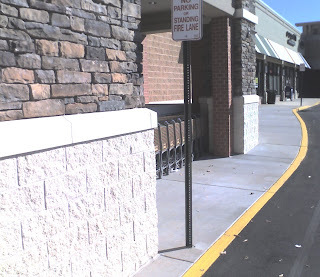 This narrow section of sidewalk is navigable without going into the parking lot, but there's not a lot of room. The point where the trash can is located is the place where there is no sidewalk option available. 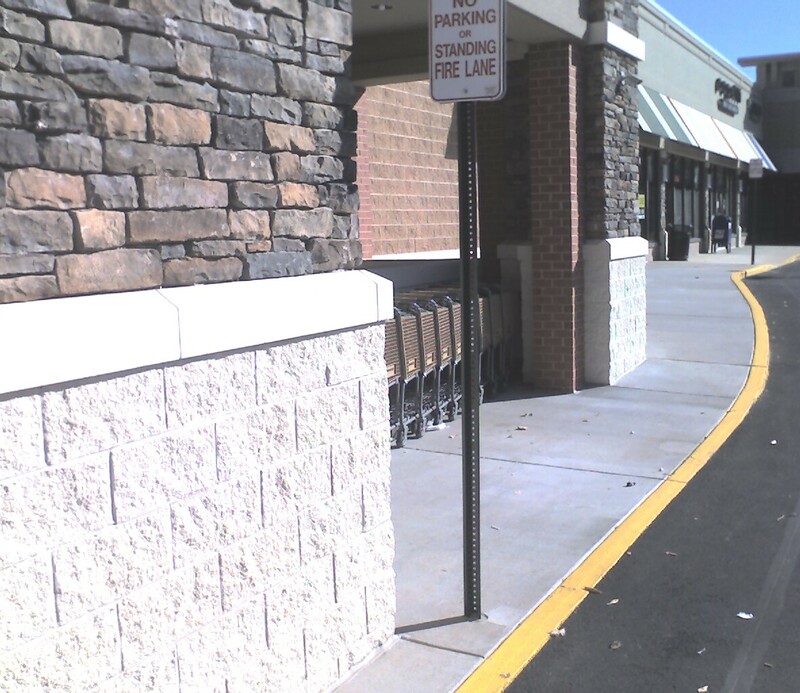 All pedestrians must walk out into the parking lot in order to pass this section. 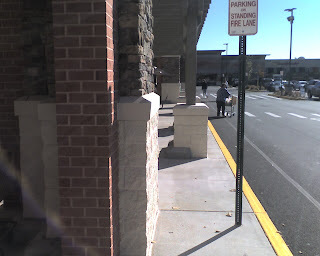 Depending on where the cart storage is, pedestrians may also be forced out at the left of the photo where the leaning sign is located. This is just past the trash can. The sidewalk is about 12 inches wide, but there is also a sign in the way. Here's a look from the opposite angle. The sign and trash can are visible on the left side of the photo. Fairfax County's zoning ordinance is hundreds and hundreds of pages. A search through the sections that deal with commercial retail properties like this shopping center resulted in virtually no mentions whatsoever of sidewalks or other pedestrian amenities. The designers of this Safeway were therefore not required to give any consideration to pedestrians, which is obvious from the outcome. Only those who drive cars were considered in their design choices. 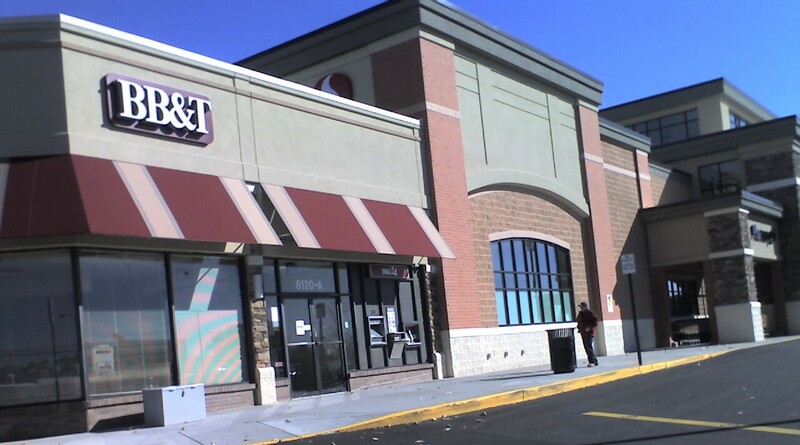 Even those who drive here and may also want to go to the bank or to the dollar store nearby are forced to step out into the parking lot traffic in order to do so. To his credit, when this problem was pointed out to the manager, he was surprised and concerned and expressed his opinion that this design would provide a disservice to his customers. Too bad they didn't ask him before they started. More than 100 people attended the film screening held on Monday evening at the Arlington Central Library. This film screening was hosted by the Arlington Bicycle Advisory Committee, with additional assistance (including sponsoring the food) from BikeArlington. Although many attendees were from Arlington, there were also representatives from Fairfax County, Falls Church, Alexandria, DC, Montgomery County and even one from Kentucky who was in town to attend the National Bike Summit. Mark Blacknell, Chair of the Advisory Committee, made some remarks and introduced and thanked a number of people, including Arlington County staff who work on bicycling related matters and the staff of BikeArlington, who work to spread the word about biking throughout the community. The film, a documentation of bicycle practices compiled by James MacKay during a 2009 European tour, was relatively technical in nature. However, it catalyzed an animated discussion afterward among attendees. As a member of the Bicycle Advisory Committee, I was excited to see so many people with ideas and opinions about how to improve bicycling in our community and the region. Afterward, approximately 20 attendees retired to a nearby bar/restaurant to carry the discussion further. The Arlington Bicycle Advisory Committee is open to the public, and all are invited to attend. Meetings are held the first Monday of the month at 2100 Clarendon Boulevard in the ground-floor conference rooms. We hope to see you there. If you are interested in keeping up with news about bicycling in Arlington and would like to be notified about future events, please visit the BikeArlington Forum or send an email to BikeArlington. Wouldn't it be great to have the kind of bike facilities that can be found in many parts of Europe right here in the DC area? Local jurisdictions like DC and Arlington are improving their facilities all the time, but there's still a long way to go. Next Monday, March 7, the Arlington County Bicycle Advisory Committee will be hosting a film screening of the 2009 SCAN tour of Europe that was sponsored by AASHTO (the American Association of Highway and Transportation Officials), FHWA (Federal Highway Administration) and NCHRP (the National Cooperative Highway Research Program). Who should come: Everyone! Especially bicyclists, pedestrians, bicyclist wannabes, planners and those interested in transportation and urban design. Feel free to RSVP at our Facebook event page; it will help us plan, but it's not necessary in order to attend. Everyone is also invited to join the Arlington Bicycle Advisory Committee afterward, about 9:00, at Carpool for our regular monthly meeting. Arlington BAC meetings are open to anyone, and all are welcome. "Each and every day roughly 500,000 citizens choose the bicycle in Greater Copenhagen. This blog highlights who they are, why they do and how it was made possible. Forty years ago Copenhagen was just as car-clogged as anywhere else but now 37% of commuters crossing the city boundary ride bicycles each day. That number rises to 55% in the city proper. Copenhagenizing is possible anywhere." It's a quick look every day at something cool or interesting about urban bicycling. Take a look.